The early December ice store was brutal on trees around north and central Texas. A walk around your property or neighborhood most likely yielded several downed trees. While an ice-store this early in the year is unusual, there are many lessons to be learned about responding to your trees and how quickly they will recover. Below are some tips and suggestions. Survey your yard and trees. 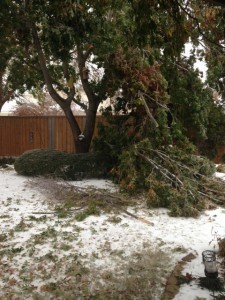 Determine if the trees could lose more branches and if they pose a threat. Look at utility lines. If the tree and/or branches pose a threat, keep clear of the area and contact a certified arborist. Carefully pick up downed branched and limbs. Leaving them on the ground poses a threat to folks waking and your animals. Many cites have posted instructions on where to put your downed limbs for city pick up. Check into this. Determine if the damaged tree is worth saving. If the answer is “no”, contact a certified arborist to remove the tree. Do not climb your tree unless you are trained in assessing trees’ weaknesses. There are too many stories from last week of folks falling off their ladder or out of their tree and breaking bones. We know a neighbor who broke both arms! Call an expert. Same goes for pulling down large branches. Let us repeat, call an expert. Unless you want to experience the AllState commercial of the guy cutting the tree branch and having it fall on the neighbors car (or house, person, bike…you get the picture), call an expert. As we mentioned above, this storm was unusual. It brought a large amount of ice early in the season when most trees were still in leaf. You’ll notice that the oaks were hit the hardest, along with ornamental pear trees. Ornamental pears seldom make it more than 10 or 15 years anyway due to their very weak branching. So what tree species are good for replanting? Live oaks, red oaks and magnolias are good, strong trees that do well in Texas. Chinquapin oaks and bur oaks along with Chinese pistachios also fair well. And don’t forget the pecan and cedar elms. This entry was posted on Friday, December 13th, 2013 at 2:00 pm	and is filed under News & Updates. You can follow any responses to this entry through the RSS 2.0 feed. Both comments and pings are currently closed.